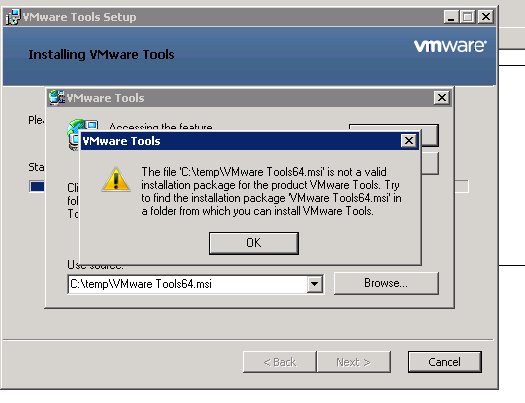 This article will tell you how to upgrade/uninstall the vmware tools on VM where msi file missing error is showing. My Name is Jitendra and I am Vexpert 2017. Vmware Tools64.msi missing during uninstallation and Setup.exe /c switch does not work. When you try to uninstall the tools via below steps. Right-click the virtual machine and click Guest > Install/Upgrade VMware Tools. Open a Console to the virtual machine and log into the guest operating system. Click Start > Run, type cmd, and click OK. A Command Prompt window opens. Change the drive to your CD-ROM drive (For example, D:\). Type setup /c and press Enter to force removal of all registry entries and delete the old version of VMware Tools. Lets start with the solution now. You are most likely be aware about a Microsot msi cleanup utility. Yes that works like charm here and you will be able to resolve your issue by Microsoft msi cleanup utility. Here we have link below from where you can download the msi cleanup utility which even dont get installed on the VM, it runs as portable tool. Whenever you see any error like below not only for Vmware tools but it also works for any kind of msi missing error on windows server. This will surely solve your issue. Lets see how to start with. The below command will run from vmtools cd via cmd. So do not forget to like or share this link if you find this helpful. and comment also your suggestion or any topic which you want to get explained or any issue.